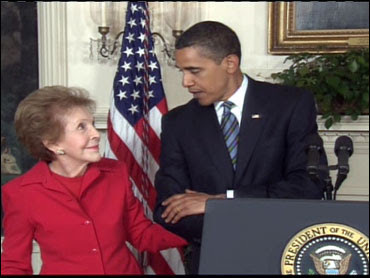 The tone on Capitol Hill may be getting ugly, but it was all sweetness and light as Barack Obama welcomed former first lady Nancy Reagan to the White House for the signing of the Ronald Reagan Centennial Commission Act. The centennial of Reagan's birth will be observed in 2011. Nancy Reagan was widely noted (and sometimes mocked by comedians) for her talent for gazing adoringly at her husband. The sight of that legendary gaze directed at Barack Obama is sure to lead to much gnashing of teeth among the hard line GOP. Ronald Reagan is the one true hero the Republican Party has these days. But too many who appeal to him as a conservative icon forget that he was not one to demonize the opposition. President Reagan understood that while there are often strong disagreements between parties and political adversaries -- disagreements that can be a source of conflict and bitterness -- it is important to keep in mind all that we share. For all of the deepest of divides that exist in America, the bonds that bring us together are that much stronger. And we may see the world differently, but we must never stop seeing one another as fellow Americans -- and as patriots -- who want what is best for the country we love. This nation was built on the basis of the principle that we are stronger, not weaker, for even the most vigorous debates -- debates that have energized our politics since the inventors of America argued over our founding documents more than two centuries ago. Mrs. Reagan is scheduled to have lunch with Michelle Obama tomorrow. Obama mentioned her work on stem cell research in his comments yesterday.